Go back about 35 years to a dusty fairground in eastern North Carolina. The Wayne County Fair was the place to be…all the school kids crowded the barn for the County Spelling Bee…yours truly was happy to go home with a green gorilla picked up as a prize simply by putting a quarter on my birthday month…is it always this easy? Reverse time about 25 years and the asphalt of the Greensboro Coliseum parking lot forms the foundation for a high-schoolers’ fair experience. At this point in life, the fair does not exist outside the experience of the midway. Except of course thru the eyes of my girlfriends’ grandparents who faithfully oversaw the agricultural exhibits…is it always this exciting? The next step back would about 15 years, pushing a preschooler in a stroller thru the quaintness of the Davidson County Fair. Separating barnyard straw from cotton-candy fingers, attempting to feed the animals in the petting zoo without dropping a quarters worth of crumbs and finally stabilizing the young one for a trip around the carousel…is it always this enlightening? 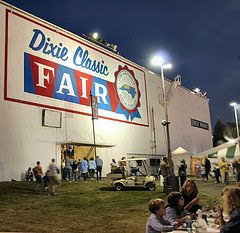 Fast forward to the most recent Dixie Classic Fair that is now behind us…there were many highlights to this year’s experience, including catching up with old friends, meeting some new ones and seeing God work in variety of ways. Perhaps, the highlight for me was the opportunity to spend an evening at the fair with my parents…something I have not been able to do in over two decades and something I may not have chance to do ever again. There were no games of chance, no rocking roller coasters, and not even a tip-toe thru the barnyard. Instead, was an evening that moved at a much slower pace, yet moved much too quickly…but was worth every step that was taken. Easy? Exciting? Enlightening? Invaluable! Previous PostIf You Give A.... Next PostChef Jeff Bacon Goes Bananas!